Google free DNS server 8.8.8.8 and 8.8.4.4 has been used by me for many years, since it is decent fast and also easy to remember. But now Cloudflare just announced their DNS server 1.1.1.1 and 1.0.0.1 on April 1st 2018. 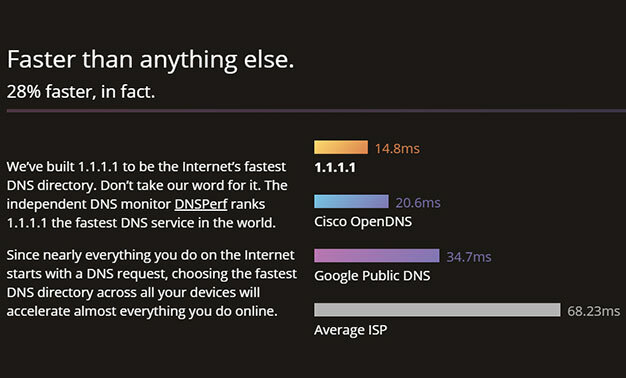 Here is their comparison diagram with other free public DNS server providers. Not only fastest, Cloudflare pledged that it will not write your ip to the disk and not keep your tracking data long, it will purge all logs within 24 hours. How cool is this privacy focus feature? Definitely, I will give it more try later if there is any need to use a public DNS server. There are lots of useful sites which helps the troubleshooting procedures. I listed some common tools or websites used by myself. Please let me know what you are using and I would like to try them and add them into this list. According to Gartner, Network performance monitoring and diagnostics (NPMD) enable network professionals to understand the impact of network behavior on application and infrastructure performance, and conversely, via network instrumentation. Other users and use cases exist, especially because these tools provide insight into the quality of the end-user experience. The fast-growing network performance monitoring and diagnostics market is helping businesses support more complex environments and services through network visibility, performance issue detection and root cause analysis. 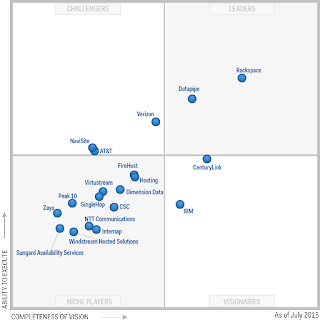 Leaders in this industry are innovating around cloud-based monitoring, better support for software-defined environments and more flexible deployment models, according to research firm Gartner. The research firm estimates that the network performance monitoring and diagnostics tool market, which is a segment of the lager network management space, sits at $1.6 billion and is growing at a compound annual growth rate of 20.7 percent. 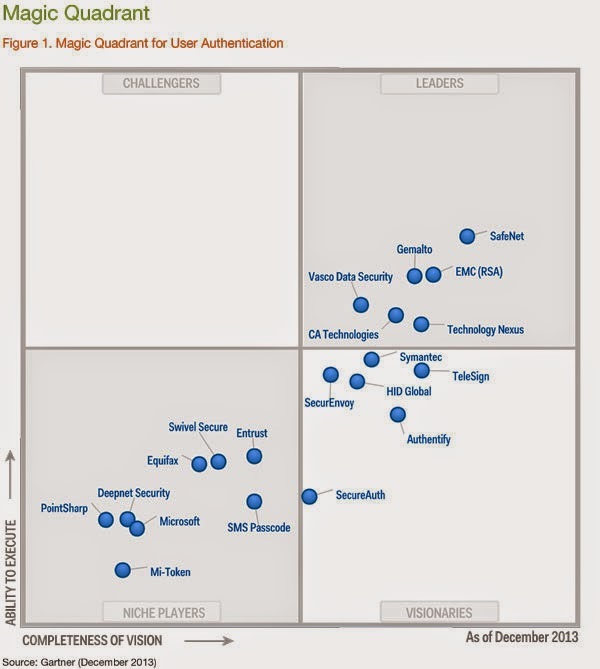 NetScout (Formerly is Fluke) , Viavi (formerly is JDSU) and Riverbed are leaders in the Gartner NPMD Magic Quadrant for the fourth consecutive year. Data center infrastructure management (DCIM) tools monitor, measure, manage and/or control data center resources and energy consumption of both IT-related equipment (such as servers, storage and network switches) and facilities infrastructure components (such as power distribution units [PDUs] and computer room air conditioners). 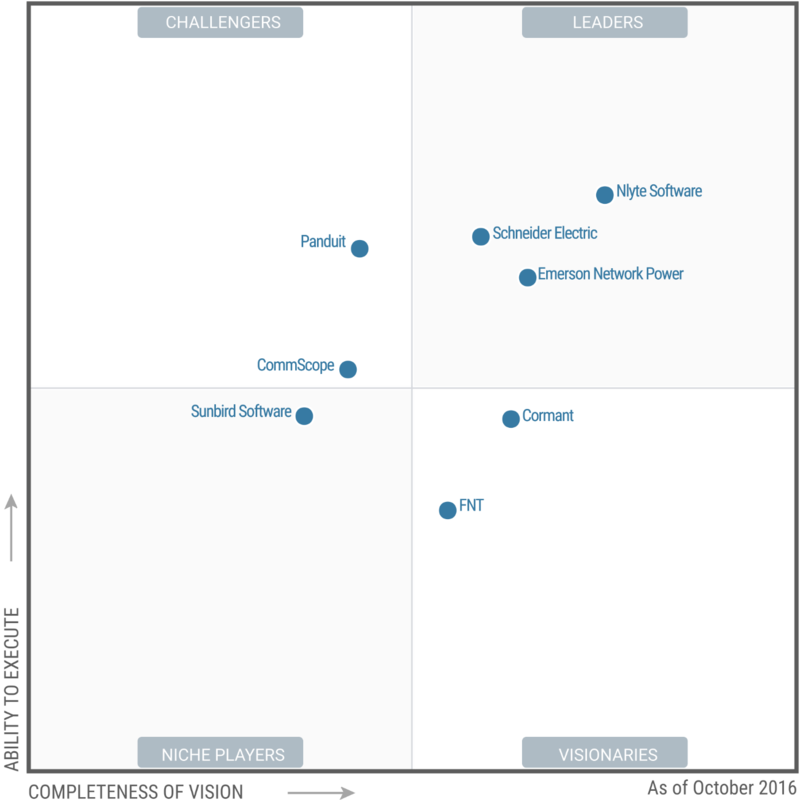 Based on Gartner report on Oct 2016, Nlyte Software, Emerson Network Power, and Schneider Electric continue to lead in the DCIM software market. My company has used Avocent ACS (Advanced Console Server) to do network devices' console management for many years already. I were using 4000, 5000 and 6000 serie, and now 8000 series is coming to refresh some old ones. The basic steps and commands are same for all those three types of ACS hardware. Emerson (EMR) acquired infrastructure management specialist Avocent Corporation (AVCT) for $1.2 billion on Oct 2009. Since then Emerson combined its Aperture and new Avocent businesses as a new division focused on helping data center customers better manage their infrastructure. Now it is part of Vertiv which launched as standalone business. 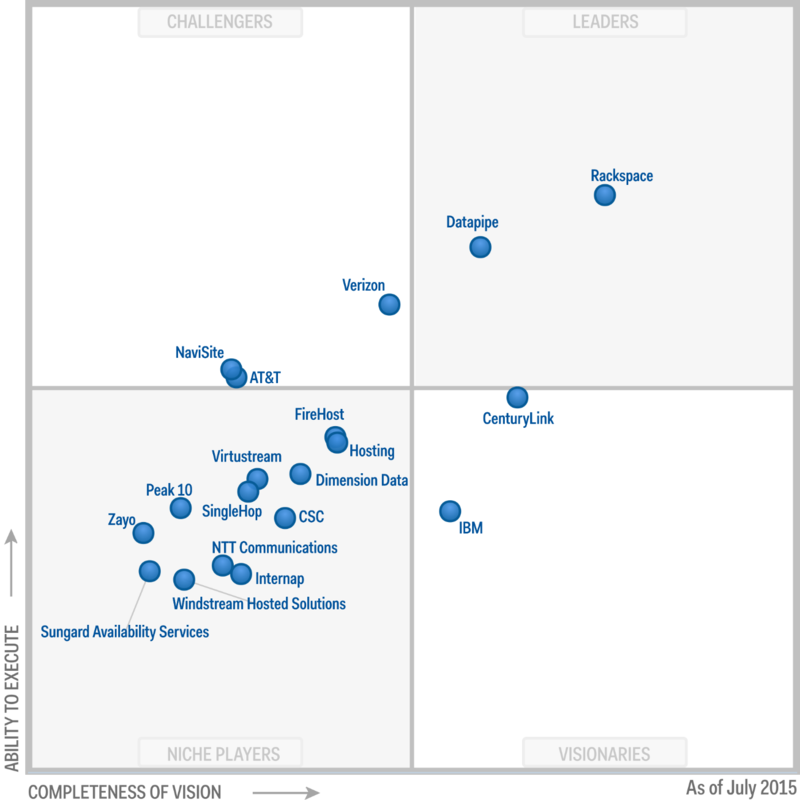 The Vertiv's Trellis DCIM platform was the first to use real-time data to enhance data center management and has been recognized as a leader in every DCIM Magic Quadrant published by Gartner. It is pretty straightforward, launch ssh client, enter your switch ip and credential, you will be in the command line. Improve the response times as experienced by users of business-critical applications over WAN links or mobile connections, often addressing application performance problems caused by bandwidth constraints, latency or protocol limitations. Assist in maximizing the ROI for WAN bandwidth, and delay costly bandwidth upgrades. Optimize data-center-to-data-center (DC-to-DC) traffic for faster replication and synchronization. The Infoblox NT 1400 network automation appliance is designed to automate network change, see the impact of changes on network health, manage network configurations and meet a variety of compliance requirements. 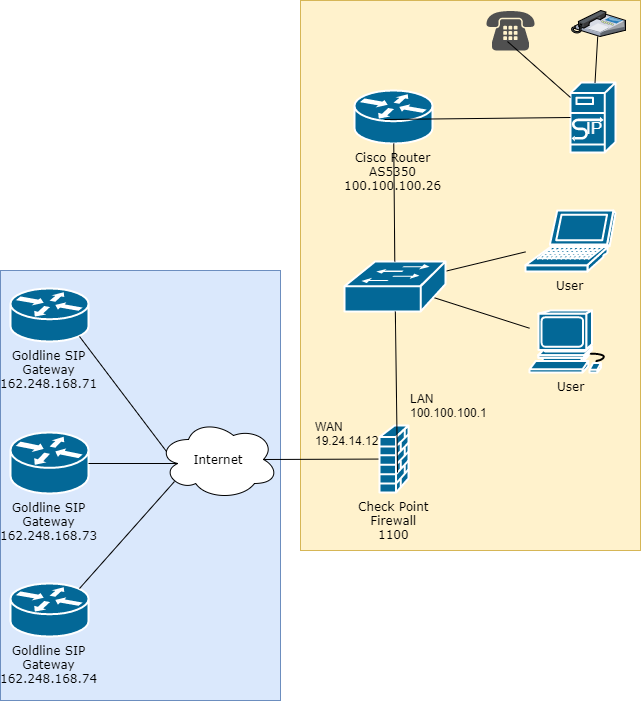 Automatically and continually track multi-vendor infrastructure, end hosts, network constructs (routes, VLANs, virtual forwarding and routing, etc. ), and topologies with current and historical information. Automatically detect and audit network changes and receive detailed analysis. Take advantage of configuration back up, powerful search, and correlation of network problems with time and location. Manage network-wide change tasks with simple yet robust methods for encoding change logic with minimal scripting. Automatically and continuously assess network changes in real time against security policies with an easy-to-use rule studio. Get analysis and alerts on network configuration problems, including ticking time bombs that show no fault or performance symptoms. Manage your network from your mobile device. View network inventory, find device locations, and control port and VLAN connections. Get a solution that ships on a purpose-built hardware device and includes the operating system and database, reducing your costs and maintenance requirements. The cloud-enabled managed hosting (CEMH) market deals in standardized, productized hosting offerings that combine a cloud-enabled system infrastructure (CESI) platform — comprising compute, network and storage hardware owned and operated by a service provider — with cloud management platform software to facilitate self-service and rapid provisioning with managed services (see "Technology Overview for Cloud-Enabled System Infrastructure" ; note that this document has been archived; some of its content may not reflect current conditions ). The infrastructure platform may be located in a service provider's data center, or optionally at the customer's data center, but, either way, it requires standardized deployment across all customers and uses a single code base that has been pre-engineered and/or predeployed by the provider prior to customer sign-up. 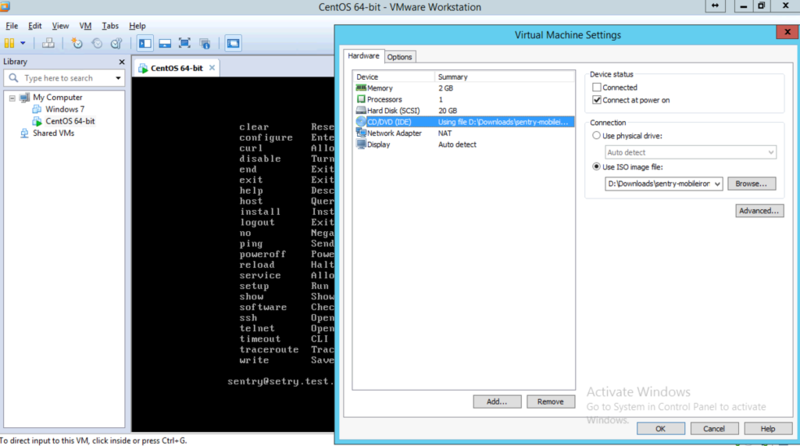 At minimum, a service provider must supply server OS management services, including guest OS instances when virtualization is used. The provider may optionally supply other managed and professional services relating to the infrastructure's deployment and operation. Cloud-enabled managed hosting allows only limited customization. It is sold on a stand-alone basis, with no requirement to bundle it with — for example — application development, application maintenance or data center outsourcing (DCO) services. Customers must be able to access a self-service interface, which may be different from the platform interfaces used internally by the provider. A service provider can potentially intervene in the self-service workflow to manually approve, deny or alter a customer's requests, as long as the provisioning requested is fulfilled in a fully automated manner thereafter. Managed services (such as OS backups, patching and monitoring) must be available to customers on commitments of less than one year. MobileIron's [email protected] App connects your Android device to your company network so that you can easily and securely access email and other work resources. [email protected] App works in conjunction with a MobileIron Core server deployed by your company’s IT organization. .
Infoblox NetMRI product has been really helpful to manage network environment. The post Use Network Automation Tool Infoblox NetMRI Push Configuration to Multiple Network Devices explains how to do a batch job with some clicks. 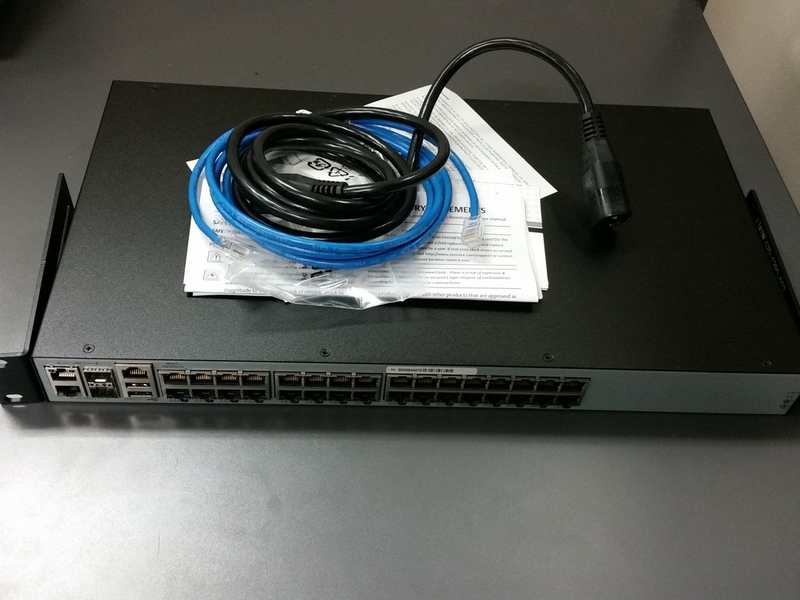 This post will explain how to update NetMRI product with some learned experience. For those still do not know what is Infoblox NetMRI product, here is some simple introduction. Actually it can do more than what normal network administrators think. 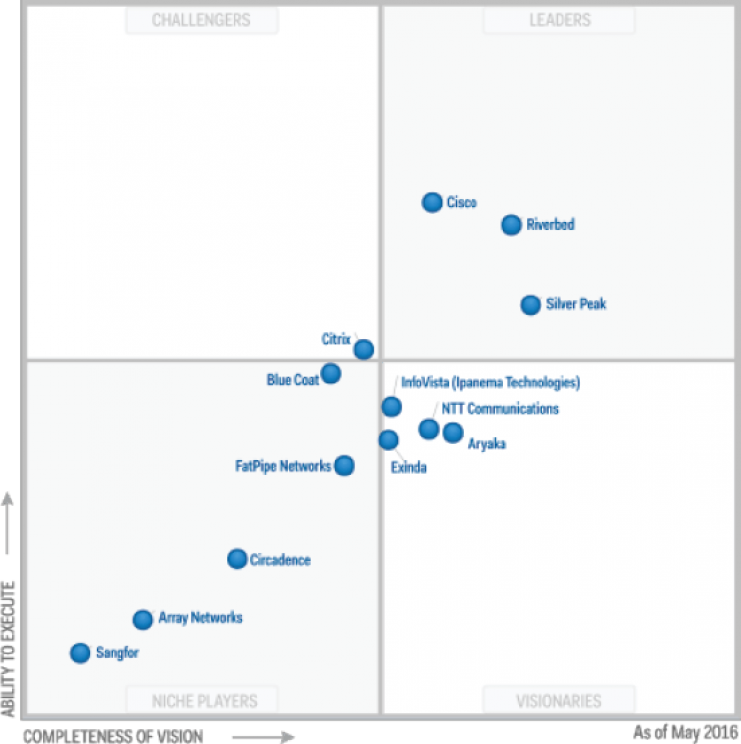 NetMRI is one of the most important products owned by Infoblox. This product came with the acquisition of Netcordia in 2010. NetMRI provides automatic network discovery, switch port management, network change automation and continuous configuration compliance management for multi-vendor routers, switches and other layer 2 and 3 network devices. NetMRI helps customers move from out-of-date spreadsheets, error-prone manual processes like scripts and CLI access and ad hoc audit teams. The packet will be sent in the same vlan. 1. A sends ARP -who is 10.1.1.3? 5. 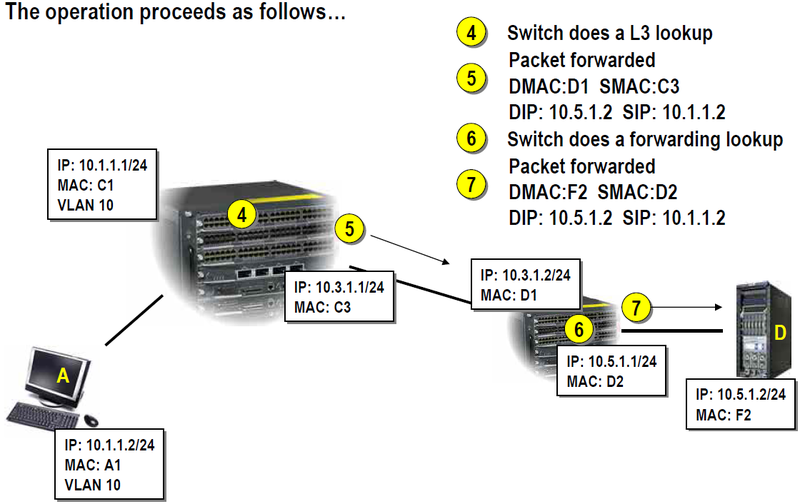 Switch performs CAM lookup using destination mac address and forwards packet to B1. 1. A sends ARP - who is 10.5.1.2? As a network guy, you will work with NTP (Network Time Protocol) lots for your network devices. "The protocol is usually described in terms of a client-server model, but can as easily be used in peer-to-peer relationships where both peers consider the other to be a potential time source.Implementations send and receive timestamps using the User Datagram Protocol (UDP) on port number 123. They can also use broadcasting or multicasting, where clients passively listen to time updates after an initial round-trip calibrating exchange. NTP supplies a warning of any impending leap second adjustment, but no information about local time zones or daylight saving time is transmitted." a. add trusted time server, in my case it is 10.9.1.1. Other configuration could be default. ktune settings are not applied. 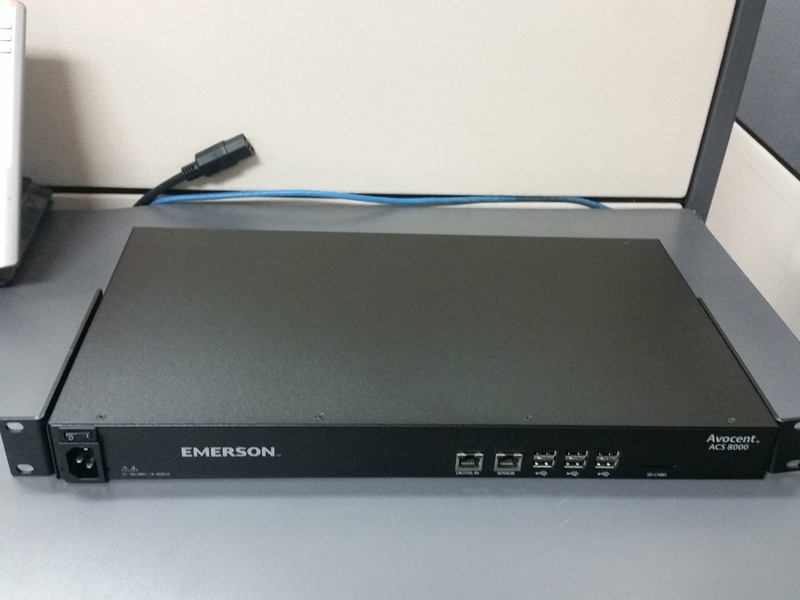 "Network bridging is the action taken by network equipment to create an aggregate network from either two or more communication networks, or two or more network segments. 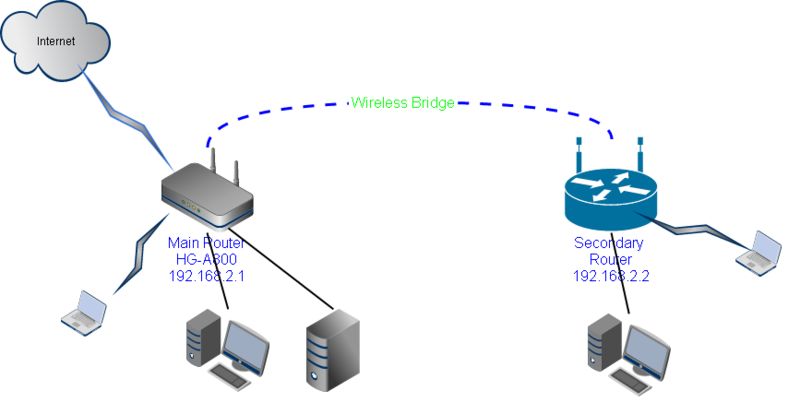 If one or more segments of the bridged network are wireless, it is known as wireless bridging. Bridging is distinct from routing, which allows multiple different networks to communicate independently while remaining separate." This post is my weekend task to get my living room's wireless signal to cover the corner of my bed room better. In the bedroom's far end from wireless router's location, the signal is always not enough to keep my ipad/cell phone persistently connected. To stop my family's complain, I decided to set up secondary router as a bridge Access Point at second floor, which will provide strong signal to upper floors. Main router is from isp, and this Adsl device model is HG-A800. This router's configuration is not any special. You just need to enable wireless security, LAN network and DHCP. 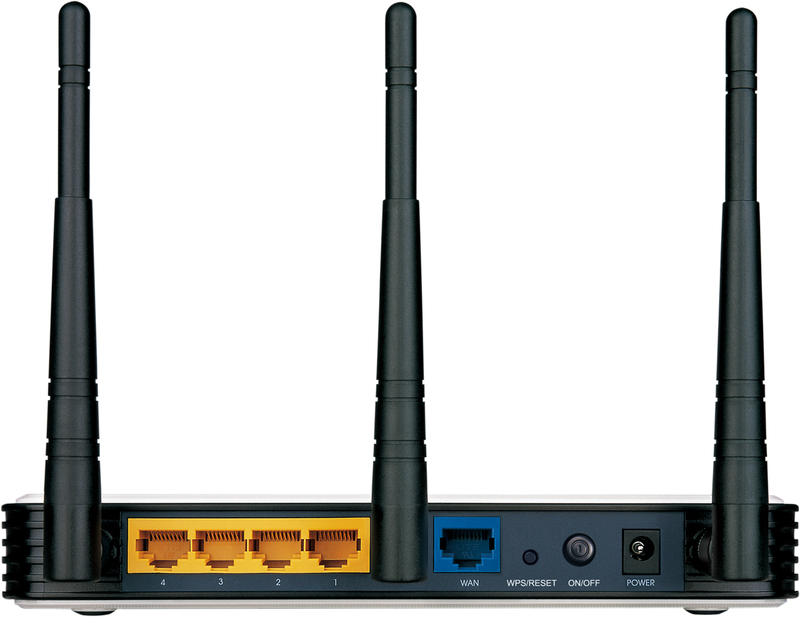 TP-LINK WR941ND is used as secondary router for bridge Access Point purpose. There is no connection on WAN port since it is secondary router which is not directly connecting to Internet. LAN port can be used to connect local network devices such as media player, game console or desktop.WAN configuration type for this secondary router will be Dynamic IP. 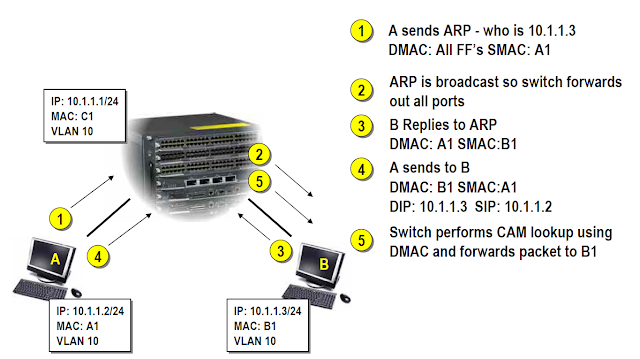 LAN IP will be 192.168.2.2. 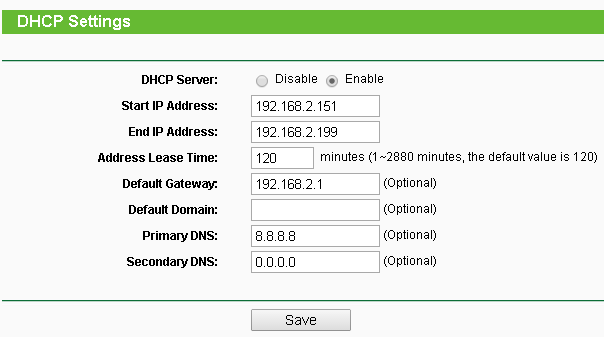 DHCP Scope is from 192.168.2.151 to 192.168.2.199. 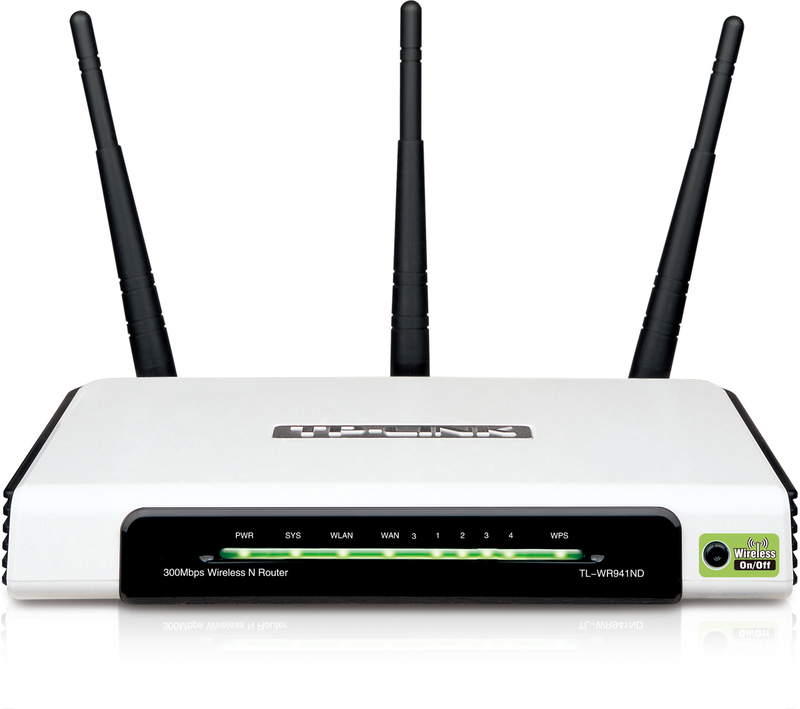 As you tell, The DHCP Scope of Primary router and Secondary router is not overlapping, which is easier for us to identify which device your system is logged in by wireless later. The most important part is Wireless Settings in secondary router. You had better set up same wireless SSID and password as Primary router, especially at SSID (to be bridged) section. Note. As you can see the channel is manually set to 6 to match your main router. 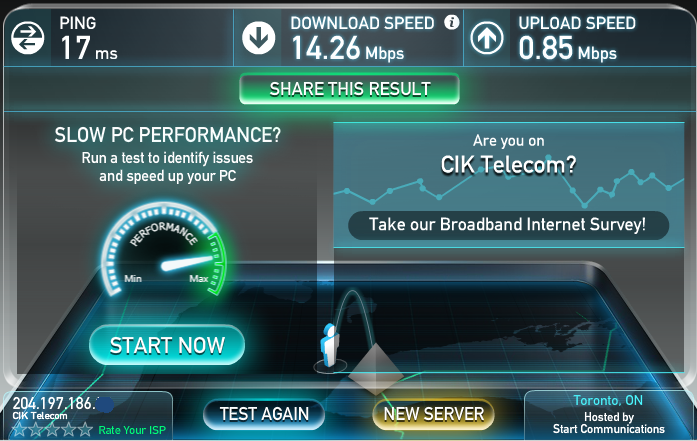 My ISP is providing 15 mbps downloading speed and 1 mbps uploading speed. From the speedtest.net's result, it shows pretty good result from Secondary router, almost no loss from this set up. Based on Cisco Document (ID108076) Troubelshoot Network Time Protocol (NTP), Cisco devices are not able to Sync NTP to W32 Based Time Service. "Windows W32Time shows that it is an SNTP implementation inside (rather claiming itself NTP). Cisco IOS-NTP, which tries to sync with W32Time, gets its own root-dispersion value that it sends to the W32Time and this proves costly for Cisco IOS-NTP to synchronize. Because the root-dispersion value of Cisco IOS-NTP goes higher than 1000 ms, it unsynchronizes itself (clock-select procedure). Since the Cisco IOS based routers run the full RFC implementation of NTP they do not sync to an SNTP server. In this case the output of the show ntp associations detail command shows that the server is flagged as insane, invalid. 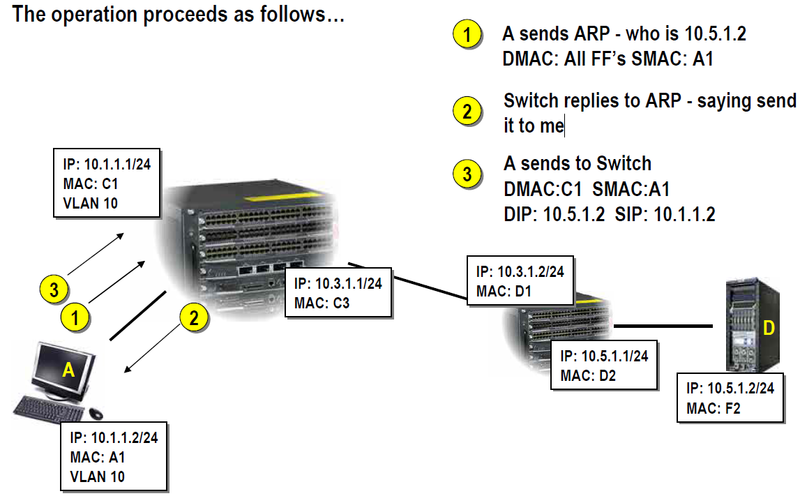 The root dispersion value is in excess of 1000 ms, which causes the Cisco IOS NTP implementation to reject the association. Routers that run Cisco IOS can be unable to synchronize to an NTP server if it is a Windows system that runs the W32Time service. If the server is not synchronized, the routers are not able to transmit to and receive packets from the server." From a Windows machine, you can use following command to very if your NTP server works. 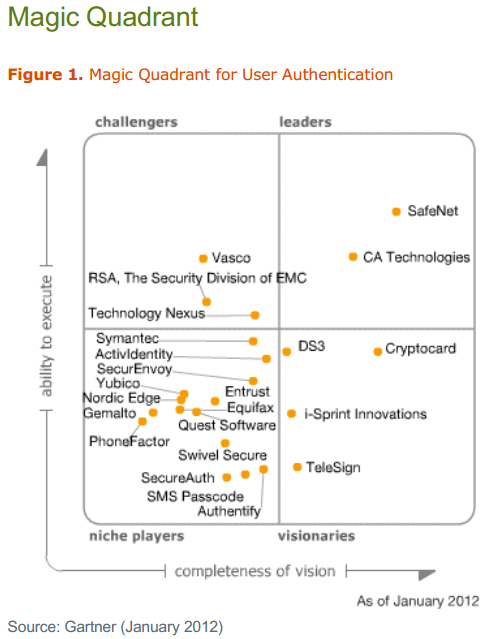 The Magic Quadrant for User Authentication depicts Gartner's independent analysis of authentication vendors in the marketplace. 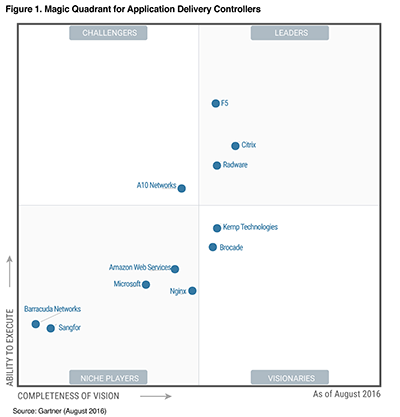 Positioning within the quadrant is based on an organization's ability to execute and completeness of vision. 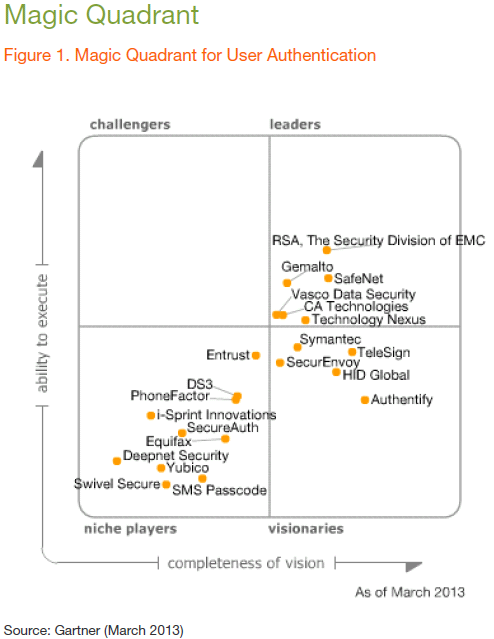 All those six companies Safenet, EMC (RSA), Genalto, Technology Nexus, CA Technologies and Vasco Data Security are in the leaders Quadrant for the second year.